Last Friday, Hubby bought this for the boys. 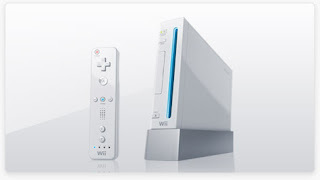 I love the sleek new look and pristine white casing. Even the various controllers and gadgets come in matching whites. 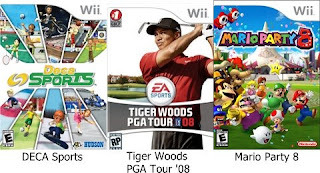 The set came with bundled with Wii Sports - bowling, tennis, boxing and golf. It has been a great tool for family bonding thus far. It is actually quite amusing, watching how the kids anticipate the moves and respond accordingly. We discovered that prices for the games vary quite significantly from shop to shop, even for the same game titles. Overall, it may be more cost effective to purchase them oveseas if we are buying more titles. 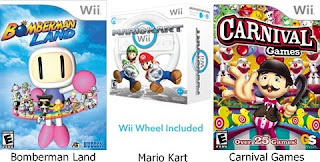 As with all computer and interactive games, Wii can be addictive. So we laid down rules regarding time and duration of play and play etiquette that must be adhered to. At the same time, it also presented us with opportunities to teach the kids about sharing and taking turns and reinforcing while playing the games. There are also platforms to talk about winning and losing and the more constructive way to react to that.